Garrison Dam is an earth-fill embankment dam on the Missouri River in central North Dakota, U.S.. Constructed by the U.S. Army Corps of Engineers from 1947 to 1953, at over 2 miles (3.2 km) in length, the dam is the fifth-largest earthen dam in the world. 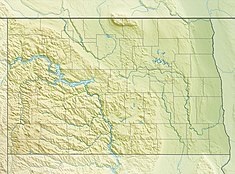 The reservoir impounded by the dam is Lake Sakakawea, which extends to Williston and the confluence with the Yellowstone River, near the Montana border. Garrison Dam is located between Riverdale and Pick City, named after the town of Garrison, directly north of the dam, across the reservoir. The dam is approximately midway between Bismarck and Minot, about 10 miles (16 km) west of U.S. Highway 83. Dams and reservoirs in the Pick–Sloan Program, and affected Indian reservations. The dam was part of a flood control and hydroelectric power generation project named the Pick-Sloan Project along the river, after the two plan developers, Col. Lewis A. Pick and William Glenn Sloan. In order to construct the dam the US government needed to purchase 152,360 acres (616.6 km2) in the Fort Berthold Reservation that would be flooded by the creation of Lake Sakakawea. These lands were owned by the Three Affiliated Tribes, which "had been their home for perhaps more than a millennium". :234 Threatened by confiscation under eminent domain, the tribes protested. A complete block of Garrison Dam power was denied because it would violate the 1935 Rural Electrification Act. The tribes achieved remuneration, but lost 94% of their agricultural land. :59–60 in 1947, when they were forced to accept $5,105,625, increased to $7.5 million in 1949.:61 The final settlement legislation denied tribes' right to use the reservoir shoreline for grazing, hunting, fishing or other purposes, including irrigation development and royalty rights on all subsurface minerals within the reservoir area. :61 About 1,700 residents were forcibly relocated, some to New Town, North Dakota. Thus Garrison Dam almost totally destroyed the traditional way of life for the Three Affiliated Tribes. :p27 Construction on the $300-million dam project began in 1947, and its embankment was enclosed in April 1953. The dam was dedicated by President Eisenhower two months later. The Corps of Engineers completed earthwork in the fall of 1954. Garrison Dam is one of six Missouri River Main stem dams operated by the U.S. Army Corps of Engineers, Omaha District. The dam upstream of Garrison Dam is Fort Peck Dam (near Fort Peck, Montana). The dams downstream of Garrison Dam are: Oahe Dam (near Pierre, South Dakota), Big Bend Dam (near Fort Thompson, South Dakota), Fort Randall Dam (near Pickstown, South Dakota), and Gavins Point Dam (near Yankton, South Dakota). These six mainstem dams impound these Missouri River reservoirs with a total combined water storage capacity of approximately 73,129,000 acre⋅ft (90.203 km3) and approximately 1,111,884 acres (449,963 ha) of water surface area. In June 2011, in response to the 2011 Missouri River Floods, the dam was releasing over 140,000 cubic feet per second (4,000 m3/s), which greatly exceeded its previous record release of 65,000 cu ft/s (1,800 m3/s) set in 1997. The first use of the emergency spillway due to flooding started on June 1, 2011 at 8:00am. Hydropower turbines at Garrison Dam have an electric power generating nameplate capacity of 583.3 MW. Average production of 240 MW serves several hundred thousand customers. The Garrison Dam National Fish Hatchery is the world's largest walleye and northern pike producing facility and also works to restore endangered species, such as the pallid sturgeon. ^ "Garrison Dam/ Powerplant". U.S. Army Corps of Engineers. Archived from the original on 24 October 2004. Retrieved 19 June 2011. ^ a b c d "Summary of Engineering Data – Missouri River Main Stem System" (PDF). Missouri River Division. U.S. Army Corps of Engineers. August 2010. Retrieved 2012-08-17. ^ a b "Facts about Garrison Dam and power plant" (PDF). U.S. Army Corps of Engineers. n.d. Archived from the original (PDF) on 1 June 2011. Retrieved 19 June 2011. ^ "Garrison Dam and Powerplant". U.S. Army Corps of Engineers. Archived from the original on October 24, 2004. ^ Meyer, Roy W (1977). The Village Indians of the Upper Missouri: The Mandans, Hidatsas, and Arikaras. Lincoln: University of Nebraska Press. ^ a b c d Lawson, Michael L. (1982). Dammed Indians: the Pick-Sloan Plan and the Missouri River Sioux, 1944–1980. Norman: University of Oklahoma Press. ^ "The History and Culture of the Mandan, Hidatsa, and Sahnish". North Dakota Studies curriculum for grades 4 and 8. State of North Dakota. n.d. Archived from the original on 7 October 2011. Retrieved 12 February 2012. ^ "Spillway spectacle". Minot Daily News. June 4, 2011. Archived from the original on 2015-10-19. Retrieved 1 December 2014. Wikimedia Commons has media related to Garrison Dam.